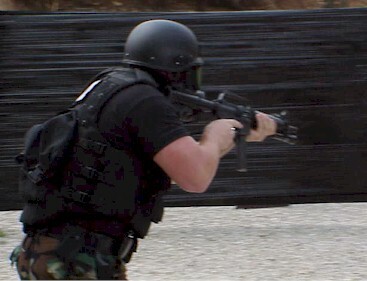 It was a tremendous time at the 2001 Midwest SWAT/SMG Championships. The caliber of competition was never higher, and the competition never fiercer! When the guns fell silent, the smoke cleared and the scores were tallied, there was a complete numerical tie! Never before in a competition had I ever witnessed a tie, with electronic timers, accurate to hundredths of a second, combined with the scores fired by the competitors. Former champion Mitch Brim, from Shawnee, KS PD was tied with newcomer Tony Caspers of the Minneapolis, MN ERU Team with identical scores of 578.80. The score sheets had been pored over seven times by the statistician. We devised a shootoff. Ten yards, six Bianchi falling plates, three runs with the MP5, fastest single run wins. After the smoke cleared Tony Caspers had the championship with a blistering run of 2.75 seconds. 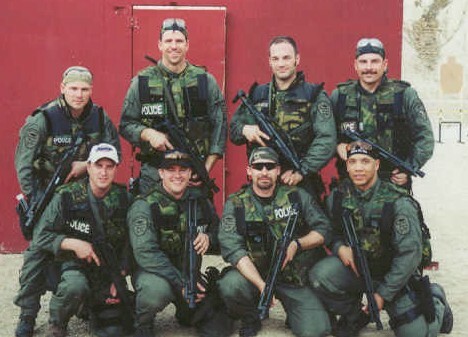 The members of the Minneapolis, MN Emergency Response Team. Tony Caspers is second from left, kneeling. Go LEFTIES! 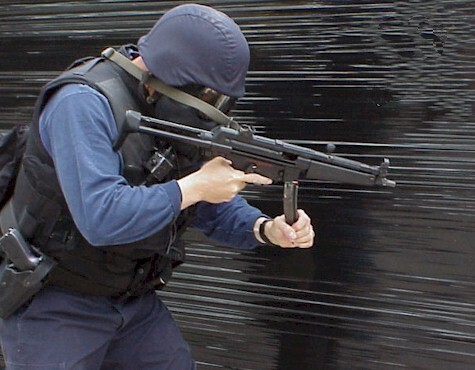 They prefer full size MP5s with MP5K vertical foregrips. 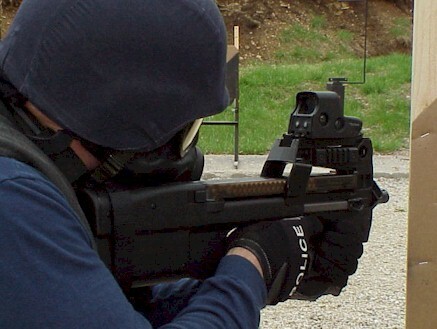 With four individual events, one two man team and the four man team event, the Midwest SWAT/SMG Championships is to our knowledge the only competition in the country designed specifically around the operational use of the submachine gun. An officer from Olathe, KS PD ERT proceeds through the gas mask stage with his Colt SMG. This is the first appearance in four years by a team with other than HKs. Olathe is only two weeks away from taking delivery of 23 FN P90s, and they were hoping to have them for this match. Tony Caspers and his crew learned of the match solely from HKPRO, and decided to make the eight hour trip. They came and they all shot very well. They promise to bring more shooters next year. This match was the first time that the hometown boys, the Columbia Police Department took top honors in the four man team event. Closely chased by Minneapolis, they finished barely a point above, a hostage target hit causing the Minnesota team to fall to second place. With the guns stowed and the gear put away, it was time for dinner, graciously provided by Buffer Technologies. Larry Bullock provided the great pork steak dinner for all to enjoy. Sgt. 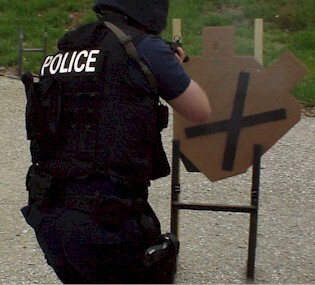 Tim Moriarity fires the demo P90 around a hostage target. Other sponsors made the match the best it has ever been. Ken Flood from Bruce Odle and Associates, the local Fabrique Nationale rep, provided numerous door prizes, as well as the second place FN49 .40 caliber pistol. He also lent his demo P90 to two Columbia officers who traded it back and forth throughout the day. Jeff Hallgren was present from The Arsenal in Lincoln, Nebraska, the largest HK Law Enforcement dealer in the nation in volume. Jeff provided a demo of the G36K and suppressed UMP45. The Arsenal graciously provided the first place USP Compact LEM pistol won by Tony Caspers. Jerry Greene, member of Team HK and last year's defending champion took third, and nabbed the free HK International Training Division school of his choice. Our sincerest thanks to all the sponsors who helped make this match possible! Jerry Greene performs a textbook reload on the gas mask stage. Officer Kevin Moroney from CPD puts two in the head on the move.